Traditionally this site is associated with the legendary Ban Raja. University of Calcutta carried out excavation at the site between 1938-41 and found the evidences from c.3rd cent. B.C. to c.13th-14th cent. AD. 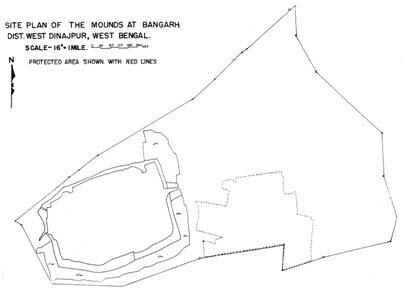 The site consists of a rectangular area enclosed by a rampart and moat. There is an extensive habitation area yielding various antiquities. The excavated remains are restored. 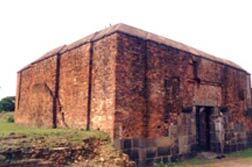 The brick-built Dargah was built probably in c.14th Cent. AD. It consists of a square Mausoleum now roofless. The Mausoleum encloses the grave of Mollah Atar-Uddin or Shah Ata. The lower portion of the structure is built of stone. It is actually a mosque with niches and not a Dargah. There are four inscriptions in Arabic fixed on the wall. Traces of older remains indicate the existence of a temple of the Pala period at the site.